There’s a whole lot of anime out there, so living up to one’s label name of All the Anime is a practical impossibility. Rather than literally having all the anime, it’s a more realistic aim to have examples of all anime in their catalogue. And with this release, All the Anime are one step closer to dipping their toes in all the anime pools. 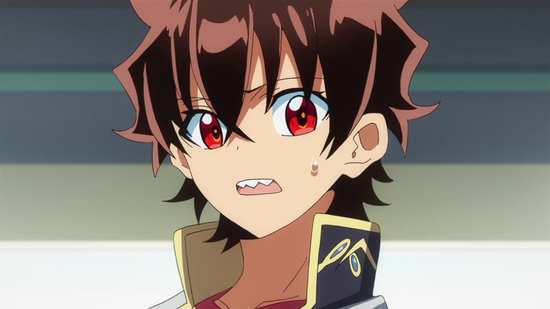 They may have distributed Fairy Tail for Funimation, but this is the first broad audience, long running series that they have attempted, 50 episodes worth of Twin Star Exorcists. A trauma in her past gave Benio Adashino cause to become an exorcist, the best exorcist there is, swearing to destroy all the Kegare demons that reside in the parallel realm of Magano, bringing havoc to this world. 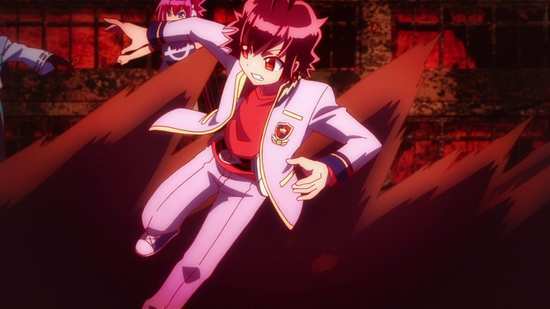 Rokuro Enmado is a natural born exorcist with an innate talent, but a trauma in his past caused him to shun the Onmyouji exorcist path, and search for something, anything else to do with his life. But it is prophesied that the two most powerful exorcists will marry, and have a child, and that child will be the one to destroy the Kegare once and for all. That’s why Benio and Rokuro are the Twin Star Exorcists, whether they want to be or not. The first thirteen episodes of Twin Star Exorcists are presented across two discs from All the Anime. Twin Star Exorcists gets a 1.78:1 widescreen 1080p transfer on these Blu-ray discs. The image is clear and sharp, with strong colours and excellent detail. 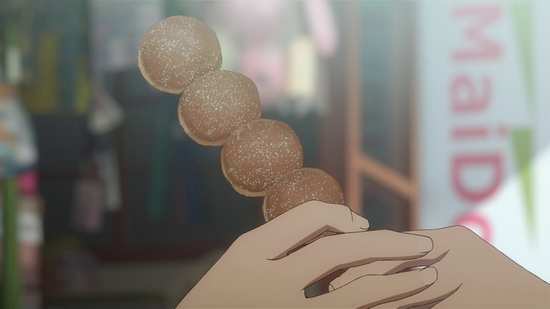 The animation is smooth and expressive, and comes across well in this transfer, with no visible compression or aliasing or even digital banding. It’s a stylish, shonen action battle anime, with appealing character designs, and a comic book approach to its action sequences (plenty of dynamic freeze frames and text spelling out special moves). The Kegare initially seem a rather monotonous dark menace, but it isn’t long before you can see character and individuality in their ominous forms. You have the choice between Dolby TrueHD 5.1 Surround English and Dolby TrueHD 2.0 Stereo Japanese with player locked subtitles and signs. I gave the English dub a quick try and nothing really struck me as painful about it, but as always I prefer the Japanese with subtitles. The dialogue is clear, the actors are suited to their roles, and the action comes across well, even through the stereo track. What impresses about this show is the incidental music, really driving that action with stylish and memorable tunes. The last time I heard music this good for a shonen action show was for Soul Eater. The subtitles are timed accurately and are free of typos. Disc 1 autoplays a trailer for D.Gray Man. Disc 2 autoplays a trailer for Saiyuki Reload Blast. Hanae Natsuki & Han Megumi’s Twin Star Room sees the two lead actors having to share some living space in some live action featurettes, with some fun and the odd interview. These are presented in 1080i 60Hz. The Opening Making Of merely shows the opening sequence next to storyboards of the same. You get the textless credits for the show and trailers for Tokyo Ravens, Noragami Aragoto, Seraph of the End, Gintama, Tales of Zestiria the X, and Berserk. I’ve started two long running Shonen Jump adaptations in short order, both kicking off with 50-episode runs, this, and Black Clover. I hemmed and hawed about Black Clover when I reviewed its first thirteen episodes, giving its bland and unimpressive tale a whole lot of benefit of the doubt. Some shows start off weak and insipid as they introduce the characters and build the back-story, only to come good in the latter half of the run. 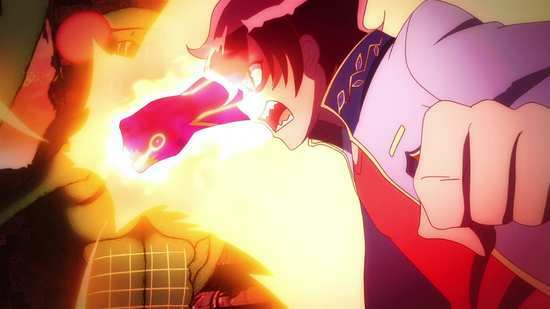 But then Twin Star Exorcists shows up for review, coming from a similar place when it comes to audience demographic, and I’m in love with it from the first frame. 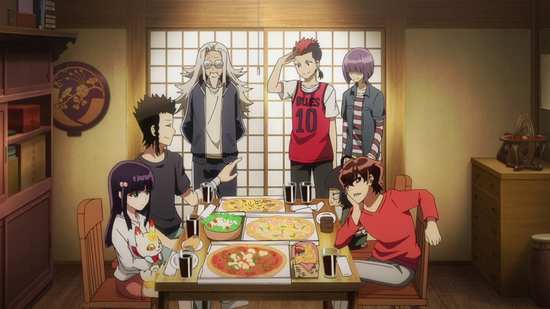 Twin Star Exorcists has style, it crackles with energy, has wonderfully drawn characters, and finds just the right pace to hook the viewer. Coupled with its extreme comic book visual style and that awesome soundtrack, I do get that same, ‘best thing since sliced bread’ feel that I did when I first laid my eyes on Soul Eater. 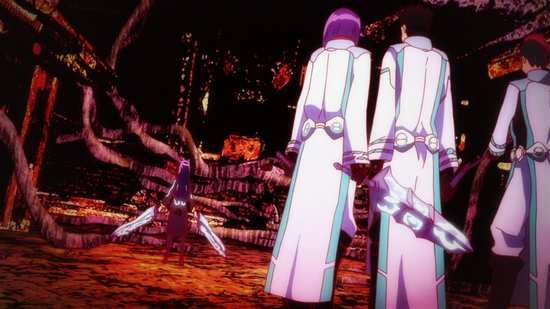 Aesthetics and storytelling style can do a lot to grab the attention, but it really only buys time for the underlying story to impress, and in that respect, Twin Star Exorcists has the same mountain to climb as Black Clover. It does a lot better in how it tells its story, and despite a couple of missteps, it does hold the attention, but how good this series is won’t be decided on the first thirteen episodes alone. You need to know how good the show is after 25, 36, or indeed the full 50 episodes. I have to admit that the aesthetics also buried my doubts about the show, of which I had many. 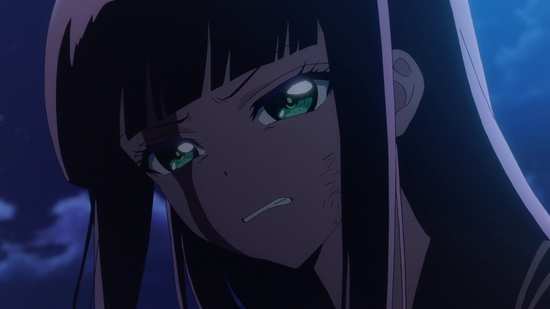 After all, when you have a show like Blue Exorcist in your collection, do you really want to have another go with Twin Star Exorcists. Exorcism, spirits, monsters and demons are a constant presence in anime, and long running shonen action shows in particular. 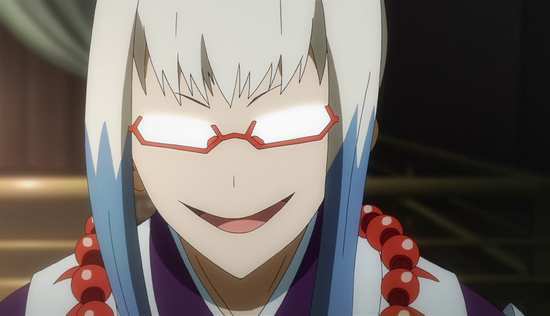 We’re in the same ballpark as Yu Yu Hakusho, Bleach, Blue Exorcist, Soul Eater, Ghost Sweeper Mikami, Tactics, Tokko, the list goes on and on... Shows about Onmyouji, the particular branch of Japanese mysticism that inspires the exorcists of this series aren’t rare either, and yes, you’ll hear the name Abe no Seimei mentioned in this show as well, although Magical Shopping Arcade Abenobashi this isn’t. 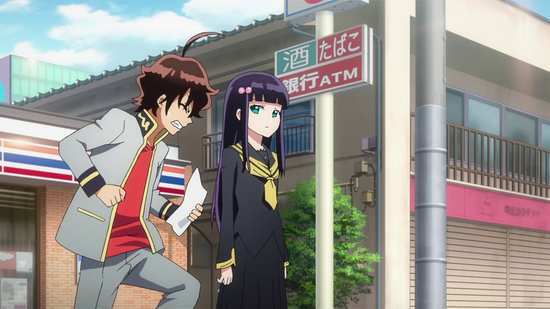 All of these shows have their own jargon and ‘rules’ and Twin Star Exorcists is no exception. The monsters in this show are called ‘Kegare’, corruption, and it takes specially trained onmyouji to purify this corruption, exorcise the beasts. This all takes place in Magano, a parallel realm that the exorcists can access, although the effects of the Kegare reach into the real world. It allows for a striking visual contrast, as Magano is a red-tinged ruined version of the real world, in which battle against the Kegare can unleash epic destruction, with no one in the real world being any the wiser. 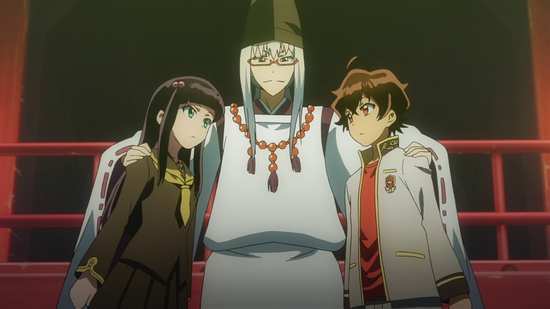 The story is all about prophecy, about how the child of the two strongest exorcists will one day destroy all Kegare, which is where our two protagonists come in, Benio Adashino and Rokuro Enmado, although at this point, they’re just 14-year old kids with a lot of innate talent for exorcism that is yet to be trained up. 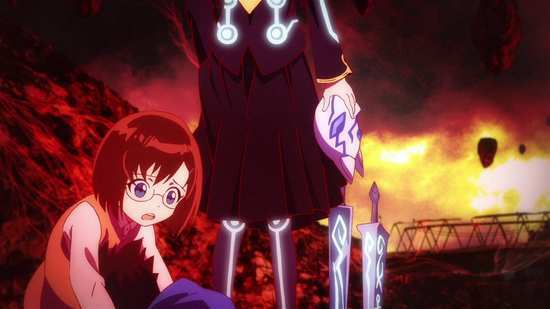 A trauma in Benio’s past has set her on a path to becoming the strongest exorcist, whereas a trauma in Rokuro’s childhood has made him quit exorcism altogether. The gag at this point is that they are the fabled Twin Star Exorcists, and so wind up engaged to be married, despite falling instantly in loathe with each other. The head exorcist even moves them into a pre-prepared love-nest to move prophecy along apace. It’s here that the show finds its entertaining balance between relationship comedy and exorcist action. 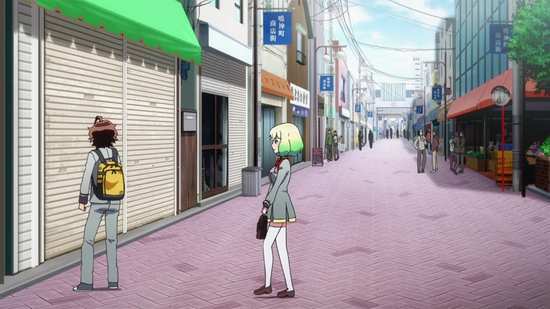 Over the course of these thirteen episodes, Benio and Rokuro gradually get to know each other, and even help each other work through their respective traumas. A couple of episodes towards the end of this collection veer towards domestic character comedy a little too much, when a flamboyant exorcist named Subaru shows up to aid their relationship. 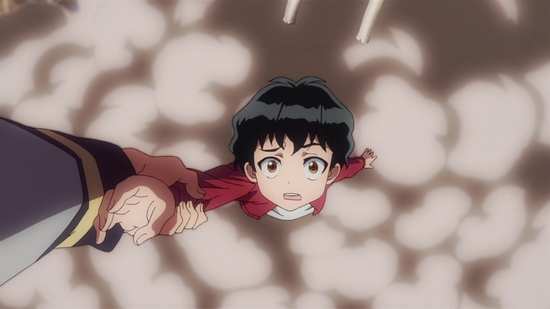 The show also makes a misstep with a couple of revelations about Rokuro’s past which come in short order, namely his role in the Hinatsuki disaster that so traumatised him, and who was actually responsible. Given that the Hinatsuki disaster also affected Benio, having a gap between the two revelations was an opportunity for drama and conflict that wasn’t taken. Things do pick up for the final two episodes in this collection, with the reveal of who might just be this series’ big villain, a Kegare in apparently human form, as opposed to the amorphous creatures that had been seen to this point. Kamui seems to be the antithesis of the onmyouji, just as capable with incantations and talismans, strong to the point of invulnerable, and on a self appointed mission to destroy the exorcists. 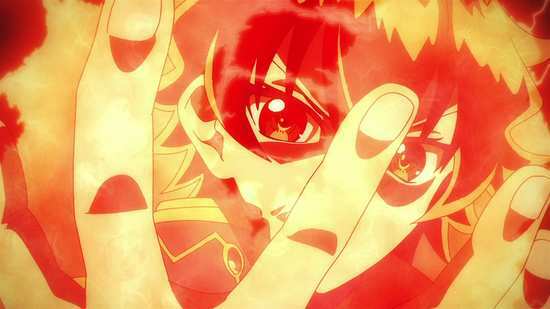 Twin Star Exorcists gets off to a rousing start in this collection of episodes. It has the momentum to really develop into something special, while the music and visuals make watching it a memorable experience. It all depends on how the next three parts of the series pan out, but on the strength of this first collection, it very much is a show to keep an eye on.